Did you spot the glitch? The answer, of course, is that the white block shadows on all three of the zeroes visible in that photo — the one on his chest and the two on his shoulders — are facing the wrong way. The block shadows on Cleveland’s numerals are supposed to be oriented up-left, but the shadows on Griffin’s zeroes are down-right. That’s because all of those zeroes were sewn onto his jersey upside-down. As you can see, they got that one right. Wel, one out of four ain’t bad. In other news from around the league yesterday. 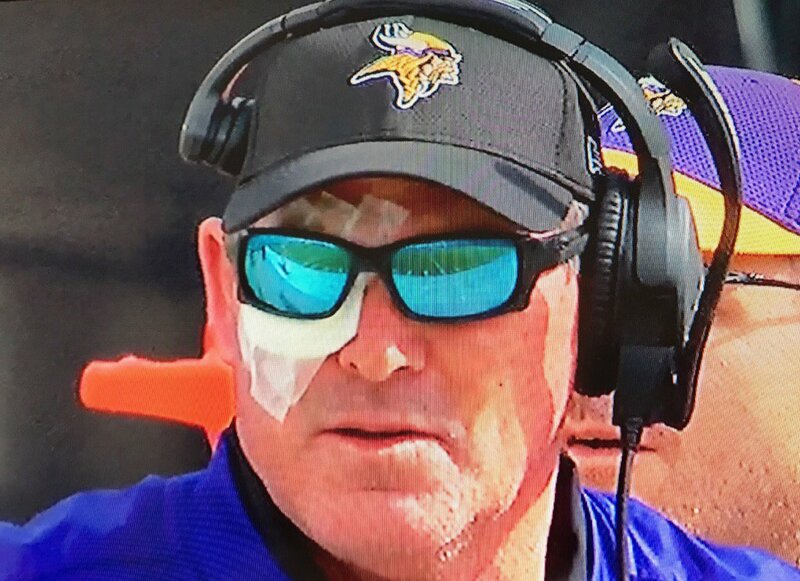 Zimmer initially wore sunglasses and then apparently switched to his regular glasses as the weather changed. We’ve seen eye patches before on the Raiders’ and Buccaneers’ helmets, but was this the first time we’ve seen one worn by a player or coach? 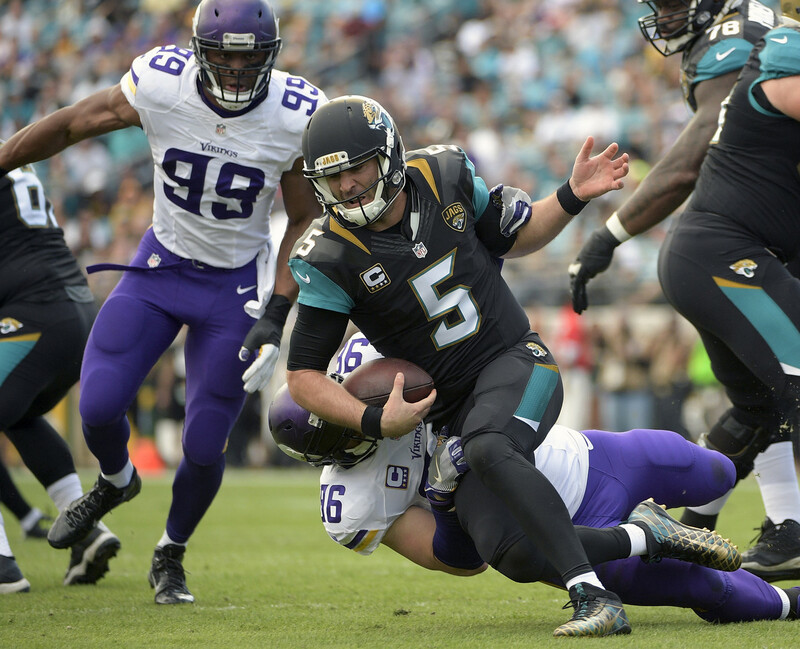 • In that same Vikings/Jaguars game, the Jags went mono-black. 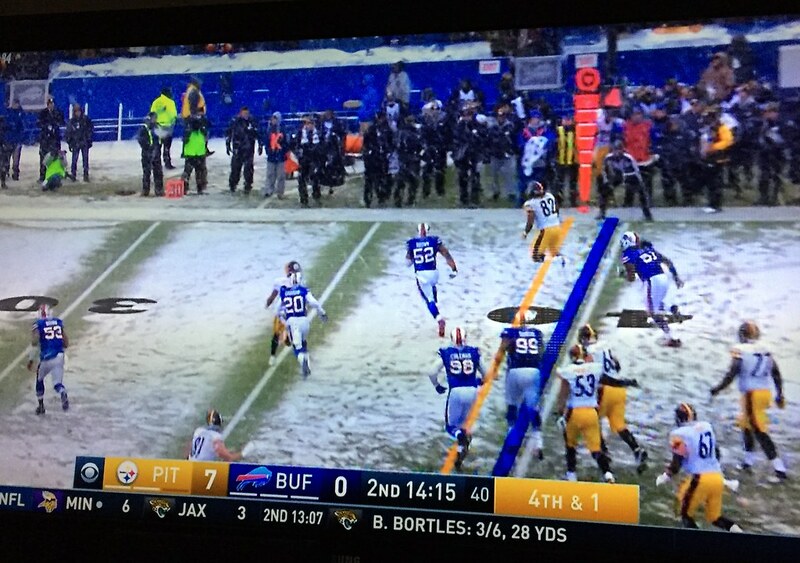 • In that same game, CBS projected black yard markers on to the field, since the white ones were hard to make out in the snow. • The Titans went mono-navy. • The Buccaneers went with red end zones. 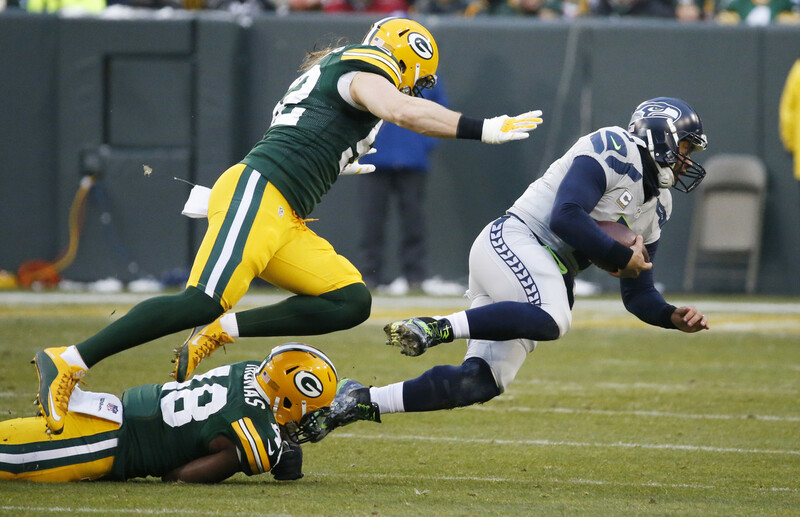 • Lions quarterback Matthew Stafford suffered a dislocated finger, which may explain why he changed gloves so often. • Looks like someone may have done a somewhat ragged job of shortening Texans quarterback Brock Osweiler’s sleeves. 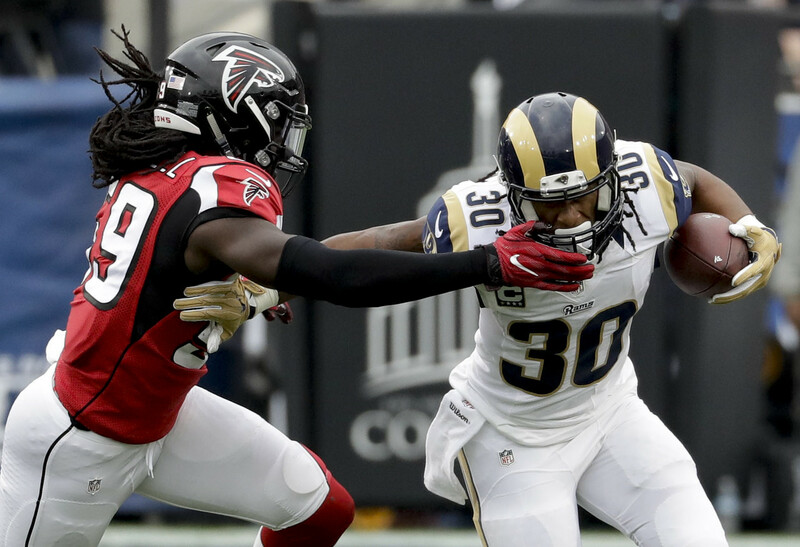 • It’s a little hard to see, but the gold ram’s horn decal on Rams defensive back Michael Jordan’s helmet appeared to go over a clip, or chinstrap snap point, or something. Same thing on the other side of his helmet. Comparing to his teammate Maurice Alexander, who’s also visible in that last shot, it appears to be a chinstrap snap. So odd that they’d run the decal over that. 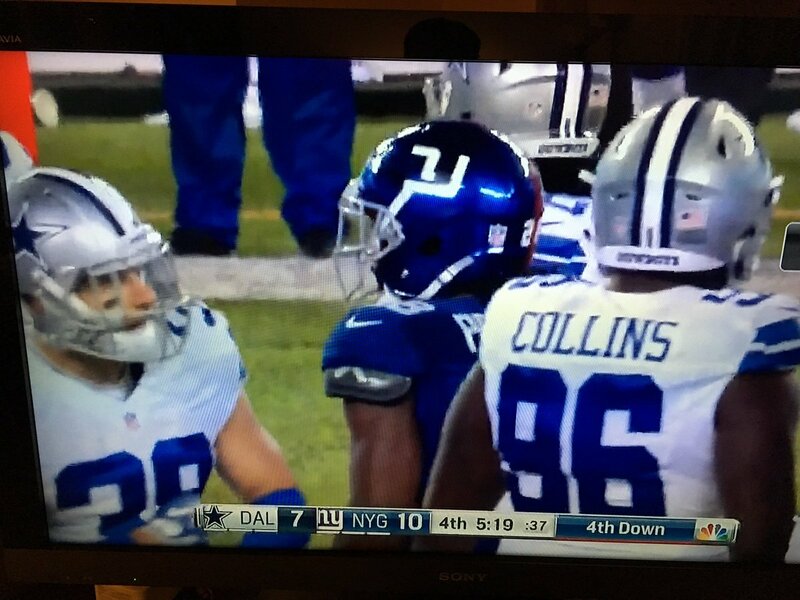 • Giants running back Paul Perkins suffered a torn helmet logo decal. • A large number of Giants players wore solid-white socks, without any blue, including wide receivers Odell Beckham Jr., Roger Lewis, and Victor Cruz, and linebackers Keenan Robinson and Olivier Vernon. • See the sweatshirt that Giants punter Brad Wing was wearing in this Nov. 14 photo? He must have been wearing that same sweatshirt under his jersey last night, because he had those candy-striped hoodie laces sticking out of his jersey collar. Unfortunately, I couldn’t find a photo of this. If anyone DVR’d the game, could you get us a screen shot? It was clearly visible when Wing came out to punt with 1:15 left in the game. • Former Yankees pitcher Mariano Rivera was at the Giants/Cowboys game and wore a No. 10 Giants jersey, presumably for Eli Manning. Weird to see him wearing anything but No. 42, but the Giants apparently didn’t want to give him that number because it’s retired for Charlie Connerly. 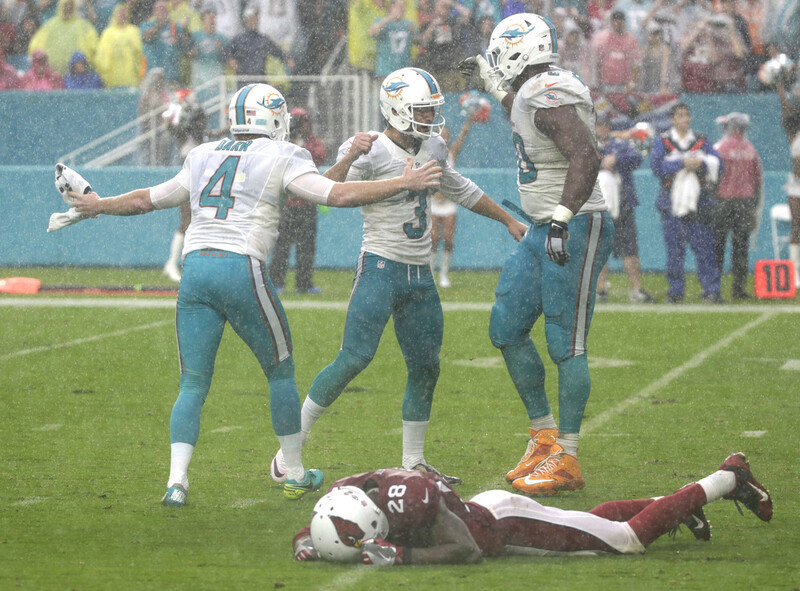 • Two teams wore white at home: the Dolphins and Rams. • Players participating in postgame jersey swaps included Jeremy Kerley (49ers) and Bilal Powell (Jets); Sammy Watkins (Bills) and Ryan Shazier (Steelers); and Adrian Phillips (Chargers) and Fozzy Whittaker (Panthers). Naming Wrongs reminder/update: In case you missed it on Friday, Uni Watch reader Patrick Nance has come up with a nifty ad-blocker extension, called Naming Wrongs, that changes the names of corporate-named stadiums, arenas, and college bowl games to their pre-corporate versions. Big thanks and hearty congratulations to the many of you who have installed Naming Wrongs, and also to those who caught some of our errors and oversights, all of which have now, I think, been addressed. As for our next step: The extension currently covers all the Big Four stadiums and arenas but only a few NCAA venues. We’d like to get up to speed on college football and basketball venues, but there are so many — so we’re asking for your help. If you know of a college football/hoops venue that (a) currently has a corporate name and (b) used to have a non-corporate names, please let us know. Thanks. The only problem is that the person who sent the card didn’t sign his/her name or include a return address, so I have no idea who it’s from. 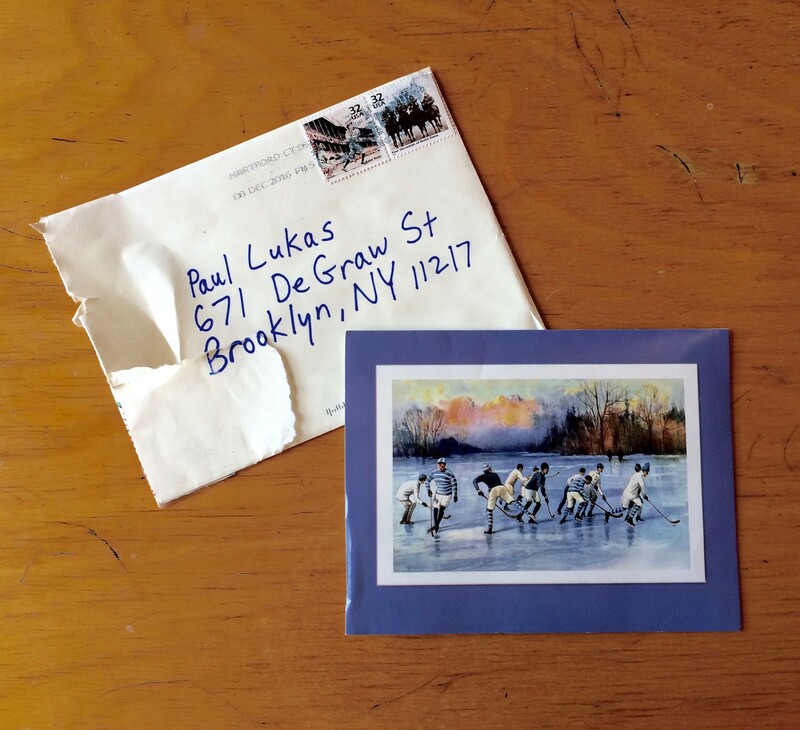 The postmark is from Hartford, Conn., so I suppose it could be from one of my ESPN colleagues, but I can’t think of anyone who’d send this type of card. The Tugboat Captain figures the whole thing is an anthrax attack, but I’m not so cynical (at least about this). If the person who sent the card is reading this, please speak up! Thanks. Uni Watch Hit Parade: I missed the boat on Margaret Glaspy, who’s apparently been playing around NYC for several years and whose debut album, Emotions and Math, was released this past summer. Most of it feels unremarkable, but the single, called “You and I” (embedded above), is really, really good. Recommended. Back in the “W” column: Excellent curling match last night, as Phil, Omoy, Doug (who wore a great sweater), and I chalked up a 5-4 win, improving our record to 4-2. This was our most satisfying win of the season, because we all played well and contributed. Already looking forward to our next game on Sunday. Baseball News: Whoa, check out the awesome satin unis worn by the Chicago Cardinals of the National Girls Baseball League, a league that existed from 1944-1954 (from the NGBL Documentary, which you can learn more about here). … The Chuchini Dragons will wear Dodgers-inspired uniforms next season. According to Graveyard Baseball, it’s a style they wore about a decade ago. 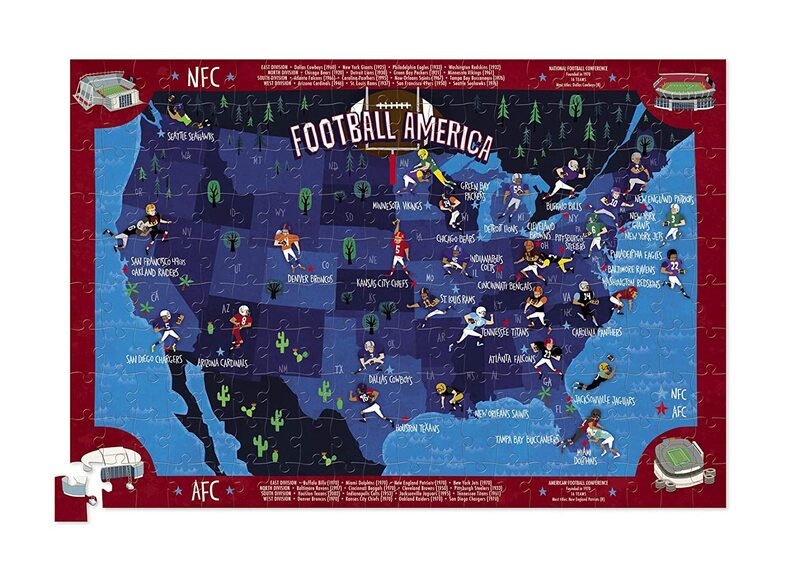 NFL News: A jigsaw puzzle available at TJ Maxx shows a map of the United States with the various NFL team locations highlighted. 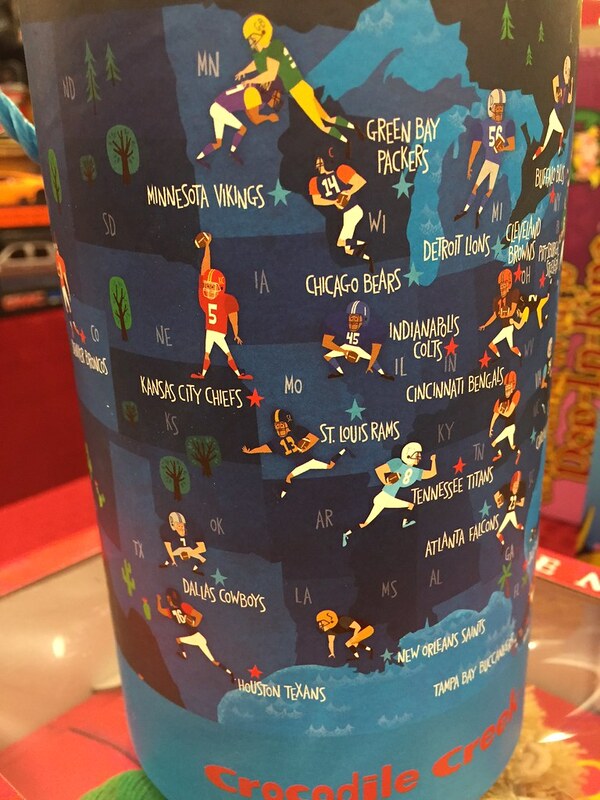 Each team is designated with little player illustrations, with the players mostly wearing the proper team colors but no logos, presumably because the puzzle isn’t an officially licensed product (from Chris Flinn). 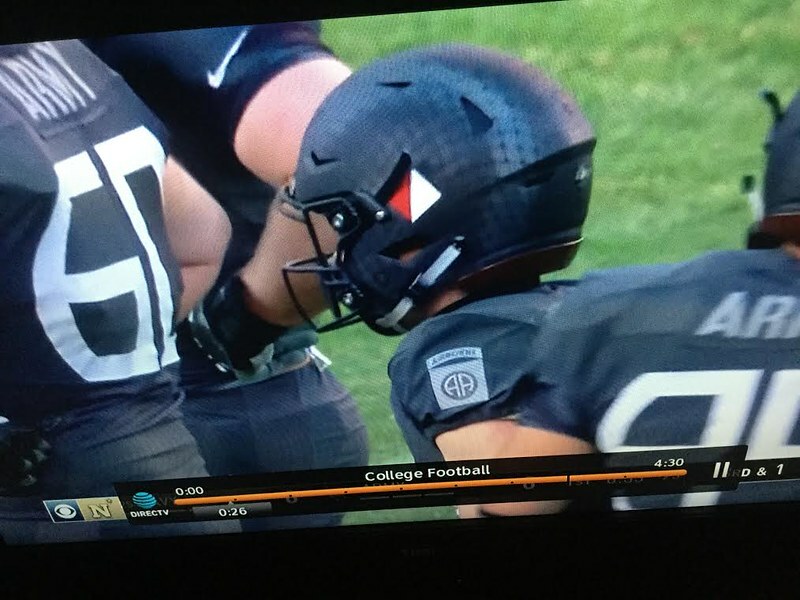 College Football News: We may have missed this when discussing Army’s uniforms on Saturday, but apparently players wore different emblems on their lids. Anyone know what they mean? (From John M.). … USF added the Under Armour logo to a graphic welcoming Charlie Strong ”” something Cincinnati also did when welcoming Luke Fickell (from @spomedome). 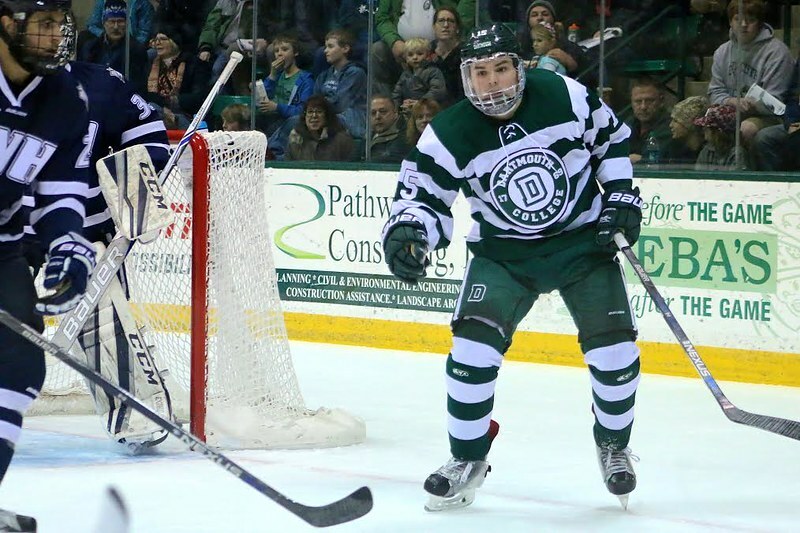 Hockey News: The Dartmouth Big Green debuted these slick new barber-pole unis on Saturday against New Hampshire (from Tris Wykes). … Looks like the Flyers’ Stadium Series unis will come with new helmet decals ”” the makers’ mark will go from white to orange. (from Patrick Thomas). NBA News: Here’s more JÃ¤germeister’s legal filing with the U.S. Patent and Trademark office, saying that the Bucks’ logo is too similar to theirs (from Andrew W. Greenwood). … The Sixers and Pistons had a red/navy color-on-color matchup yesterday (from Jason Hill). College Hoops News: Florida State went BFBS yesterday against Florida. The Gators wore orange, making a nice color-on-color matchup (from Ryan Kelly and Forrest Gmitro). … The University of Missouri-Kansas City wore beautiful alternate unis yesterday (from Sean Jankowski). Soccer News: For a weekend match between the Italian teams Udinese and Atalanta, the referee decided the two teams’ jerseys were too similar and forced Udinese to put white tape over much of the back of their jerseys (from Denis Hurley). Grab Bag: Couple of uni-themed TV items from Chris Flinn: John Cena dressed up as Rob Gronkowski on SNL this weekend, and some Harlem Globetrotter unis showed up on The Goldbergs. … The Washington Valor, a new arena football team, have unveiled their new jersey (from Bryan Firvida). 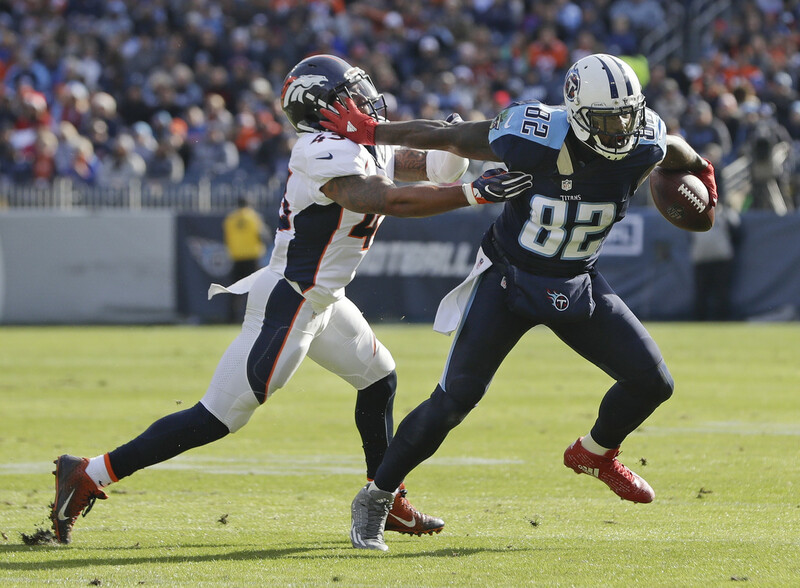 Here’s (presumably) why Von Miller wore those cleats. The different logos on the Army helmets represent different units of the 82nd Airborne Division. With regard to the different symbols on the Army helmets, do they represent different military specialties – infantry, artillery, etc? The bottom of this page explains what the different symbols from Saturday meant. Hey thanks! Nice to know the meaning of the different symbols. The Under Armour logos on the welcome graphics are likely contractual. Most school apparel deals now include logo creep on certain graphics. Coaches love them because of the branding of the program for recruiting purposes. Coaches love them because they get a massive share of $$$ and share not a dime with the slaves, I mean chattel, er players.- you know the ones that we pay to see. Oregon did something similar when their new HC was announced. They swapped their logo for the USF logo and got rid of the Under Armour logo. Shockingly, they didn’t add a swoosh, though. Ezekiel Elliott and OBJ swapped jerseys last night too. As a lifelong New Hampshire resident and graduate of UNH, it always strikes me as weird to see UNH called “New Hampshire.” In New England, its always “UNH.” Not a THE Ohio State University situation, just sounds/looks funny. I’m wondering what the statute of limitations is on that trademark filing against the Bucks. They’ve had some version/iteration of the buck head logo for many years now. I wonder if it was just the current version that prompted action, and if so, why? I had a similar response: JÃ¤germeister is just noticing now? I’d have thought they’d pay more attention to goings-on in Wisconsin. Since moving here, I’ve encountered adults over 21 drinking JÃ¤ger, unironically, because they enjoy it. I’d literally never encountered that before anywhere else. And maybe that’s a justification for JÃ¤germeister’s legal action: On the surface, a basketball team and a liquor don’t seem liable to consumer confusion. But at their core, each is a pretty terrible product that nonetheless enjoys a loyal niche following in Wisconsin. I can’t speak for Jagermeister but I know Coke-a-Cola has a group that monitors the use of its name and contacts those who use it without the TM or copywrite symbol. What if. . . the Bucks are only filing that version of their logo now? The NGBL Cardinals uniform was so remarkable it took me a few minutes to notice that the player was running the basepath BAREFOOTED. I think Seattle is even worse. I get the green…but why the dark gray? 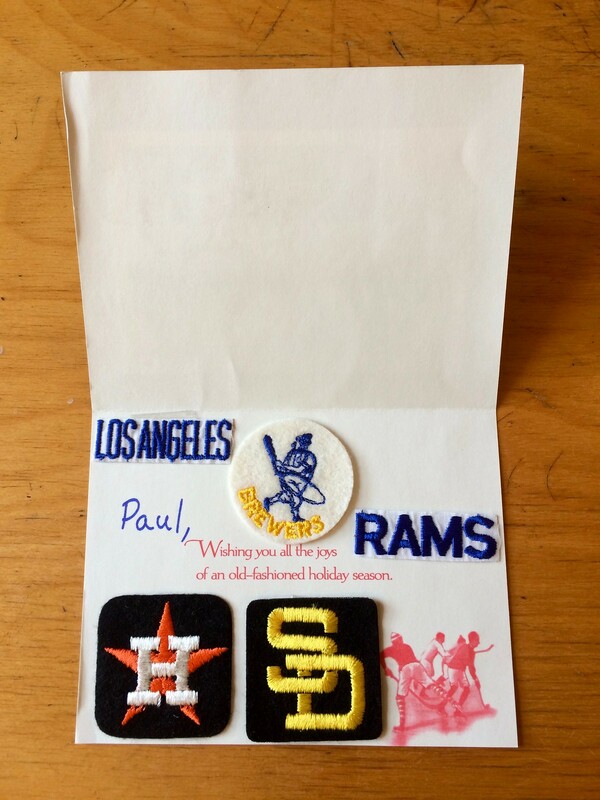 Also, while looking at the puzzle, the border lists the teams and their founding years… and there’s a few weird errors. The AFL teams are mostly listed as 1970, which is technically correct since it’s when they merged into the NFL, but still feels wrong. Then the Titans are shown as 1951 for some reason. Then there’s the Cardinals with 1946 instead of 1920, and the Ravens as 1997 instead of 1996. I would not buy this puzzle. 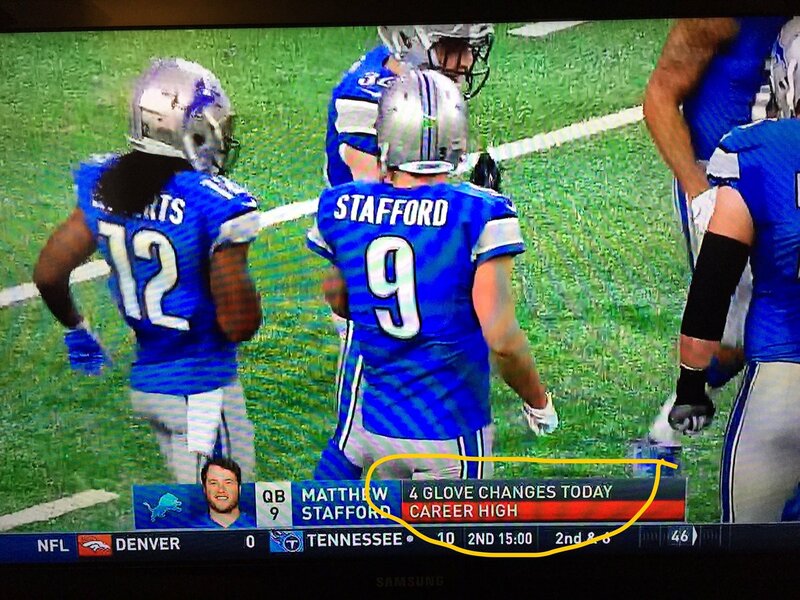 They still list the Packers as 1921. Another interesting quirk of the puzzle: it lists the Patriots as having the most AFC championships with eight. While technically correct that the Patriots have eight AFC titles, it fails to acknowledge that the Denver Broncos and Pittsburgh Steelers also both have eight AFC titles. On the puzzle, at least the St Louis Ram is running west. Comment of the day, for sure! That Browns shadow has always annoyed me – it looks much better going the other way. They should change all the numbers to that. As much as RGIII’s jersey seems to be the ‘Browns being the Browns’ … it actually looks better with the shadow casting right. Technically, black is an official color for FSU, so the BFBS unis are more BBIACT (Black Because It’s A Color Too). Isn’t RGIII’s plastic visor broken? No, that’s a reflection of the top of the stadium and the sky. Surprised there’s no mention of the Bills’ rubber pellet field snafu during halftime yesterday. Quite a scene. Wasn’t aware of that. Thanks for the update! That stuff is apparently none too good for you either. Here is some more information on how it happened. Its crazy that they just removed the pellets, aren’t they needed to maintain the “integrity” or “playability” of the surface? The manufacturer of the field insists it was perfectly fine and that all those pellets you saw are just a fraction of what’s embedded in the field. I have no idea if they’ll redistribute the pellets that were removed. 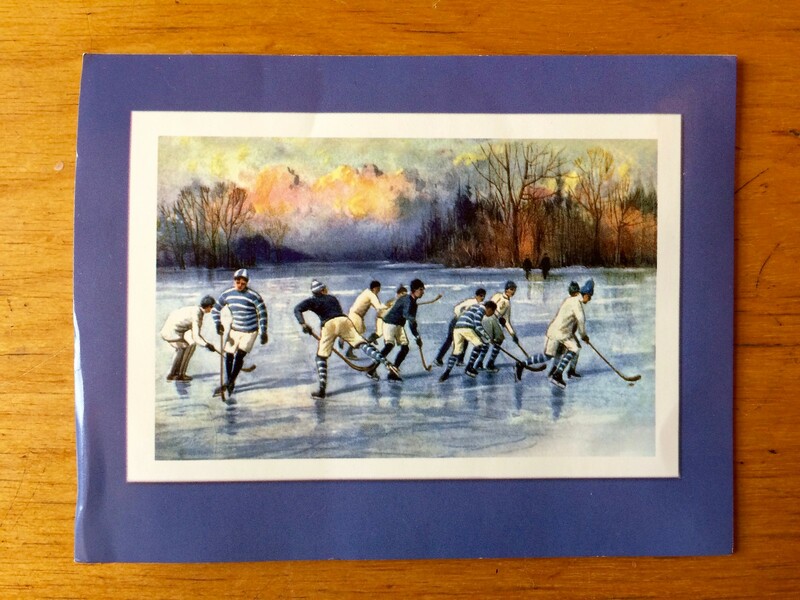 In regards to the mystery hockey holiday card you got… to make it even more mysterious, those cards are OLD! 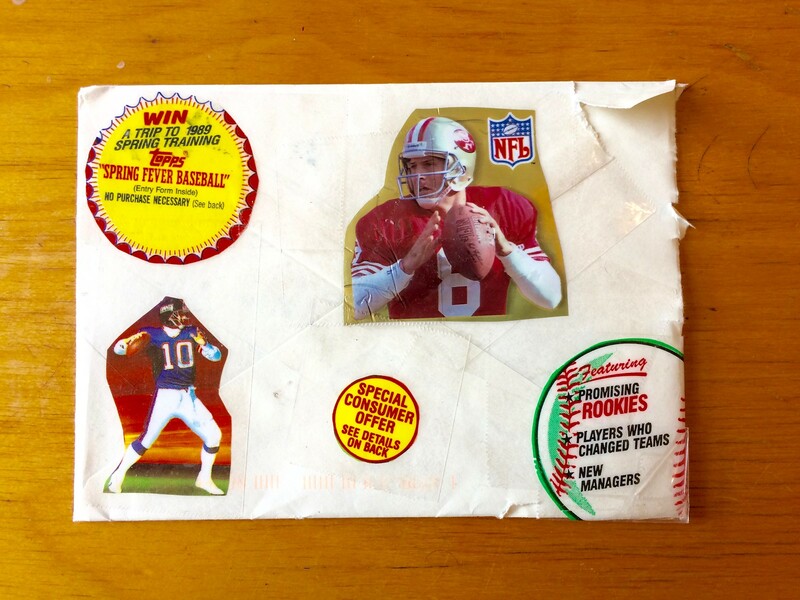 My wife and I sent those out at least 10 years ago, before the picture cards with your kids became the new thing. – Bank of America Stadium was originally known as Carolinas Stadium, but only during construction. – The Spectrum Center was originally known as the Charlotte Bobcats Arena for the first few years. Sure, the Bobcats are now the Hornets, and it would be kind of funny to read news stories about the Hornets playing the the Bobcats Arena, but there you go…. Trust me, if I had my druthers we’d go back to arenas and stadiums either with cool sounding names that made them seem like a place you wanted to go (The Omni, The Forum, The Summit, etc) or naming them as memorials to veterans, former great leaders, etc. We just had political hacks name things after themselves (Wellington Webb Municipal Building, Pena Boulevard, McNichols Arena, Currigan Hall, Quigg Newton Housing Project, Speer Boulevard, McNichols Park, Stapleton Field, etc.) . That was the best thing about Hickenlooper as mayor, he bucked that trend. I don’t think this was mentioned in the original post about righting naming wrongs, and apologies if it came up in comments, but I’m still calling it Jack Kent Cooke Stadium. Yes, we originally missed that one, but someone pointed it out to us and it’s now covered. One of my good friends went to Texas A&M when Von Miller did, and Von was extremely into chickens. He had several coops and my friend and his roommates bought like 3 chickens from him that they kept in their backyard in College Station. i believe Von majored in something related to agriculture, and maintains the chicken raising hobby today. Hence the cleats. I honestly don’t get the hate on the Bengals uniforms. I really like how instead of just doing some generic striping pattern on the shoulders/sleeves, they incorporated their name with tiger stripes. Sure it’s different, but I like that it doesn’t look like they went to the nike site to make some custom jerseys online. If you go back to the original uniforms once the Bengals changed over to the tiger-striped helmets, they looked a lot better than today’s versions. They still had the tiger stripes on the shoulders and pants, but the rest of the uniform was pretty clean and simple so a nice balance was struck. The hate is they look like 1970’s pimps. 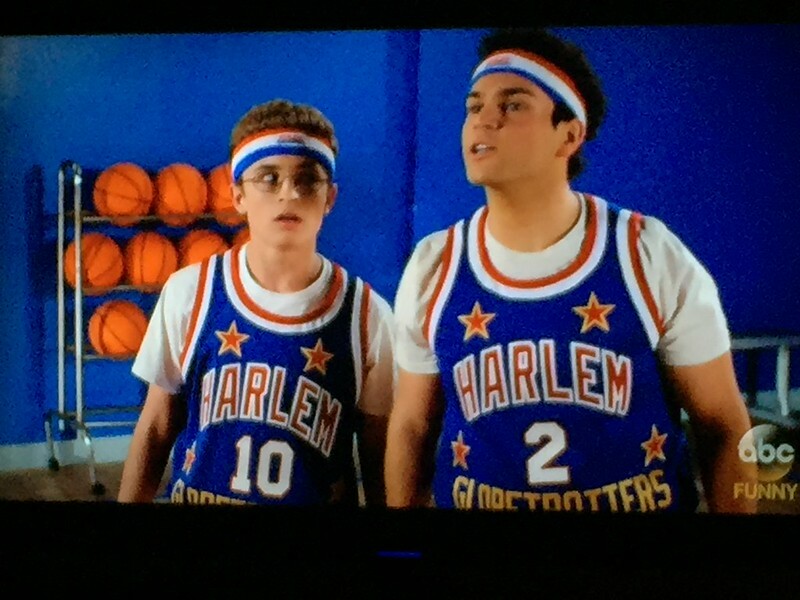 Their uniforms are awful. I thought I was getting the hang of reading the curling scoreboards, but this one has me confused. What does the “1” in the upper right corner mean? The center line is the number of points scored. The numbers on either red or yellow are in which “inning”* each team got to how many points. The lack of number 1 probably means that no one scored in the first inning*. There is a number “1” in the upper right corner of the scoreboard, above the letter “B”. What does the “B” stand for? No worries if you ever end up watching high end curling on TV, like the Olympics or the world championships. Scoreboards are baseball style. As much as I liked the contrast-stitching on the Browns jerseys in theory, I really hate it in practice. It doesn’t make the jerseys look cool, or give a “pop of color”, it just makes all the jerseys look off. Maybe dirty. Either way, I hate it. I agree. They are the only team that has this. It is obvious why no other teams do this. It looks silly. It reminds me of a sewing job you may see in an unprepared student’s home ec class. It is like they ran out of brown thread, so just finish making the jersey with the colour of thread you have. Is it just my imagination or has info about the UMKC unis been posted like 4 times in the last week? Cleveland Browns… just give it up, man. I could never, ever support a team that looks so awful, and I’m not talking about their awful play. Really, The Vikings wear the dreaded PURPLE and they’re light years better looking than you. Those Browns uniforms are the worst. Those need to be burned and they need to go back to the last set post haste and keep them until they can come up with a better replacement.